We recently reported on the People for the Ethical Treatment of Animals (PETA) campaign to systematically euthanize an entire populace of feral cats in an Arizona county. But when San Diego came looking for a solution to its feral pig problem, PETA had different views, protesting the county’s proposed lethal methods of pest control. Some background: Faced with an enormous overpopulation of feral felines, the Arizona county announced a program that traps, neuters, and then returns the cats to the wild. This method is designed as a way to control the feral population without killing the animals. In fact, according to county officials, implementing the approach will reduce the number of euthanized cats in the region by 30 percent. You would think that an organization posturing as an ally to animals would approve of this solution. But PETA criticized the program, arguing that the population of feral cats should be euthanized, instead. The so-called animal “liberation” group justified this recommendation of mass kitty-killing with its “better dead than fed” philosophy: PETA insisted euthanizing the feral animals was more humane than the TNR alternative. Unfortunately, PETA’s hypocrisy comes as no surprise: The animal “activist” kills up to 97 percent of dogs and cats in its so-called animal shelter in any given year. 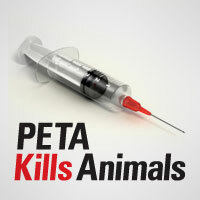 In fact, PETA has killed more than 33,000 animals since 1998. But it looks like PETA has finally found one animal it won’t kill—at least for now.